This healthy chicken and egg salad is one of my go-to lunch recipes. It tastes amazing, is so easy to make that you can barely call it cooking, and you can make a huge batch and store it in the fridge for days. My parents would often make a version of this chicken and egg salad for Sunday family lunch (with full-fat mayo, of course), but when I moved out and got my own place, it became a daily staple because it’s so healthy, easy to make, and inexpensive. Now, almost 20 years later, I still make a batch of Chicken and Egg Salad at least once a month. Step 1: Cook the chicken breast in the oven at 360 F (175 C) for 20 minutes (depending on size). You can check out my guide on How To Cook The Perfect Chicken Breast for a few tips and tricks that will make sure you cook the juiciest chicken breast you ever had! Step 2: Cook the eggs for 8 minutes. You want them hardboiled. Step 3: Mix fat-free mayo (or full-fat if you prefer) with curry powder. A LOT of curry powder. Step 4: Cut the chicken breasts and eggs into bite-sized pieces and fold them into the curry mayo. Step 5: Put the chicken and egg salad in the fridge for at least 10 minutes. It tastes much better when it’s slightly cool. In fact, leaving it overnight will allow the flavors to combine and intensify, making the salad even better. That’s it! You can make a huge batch of chicken and egg salad in just 25 minutes. And 20 of those minutes are just waiting while the chicken breast is in the oven. You can eat the salad as-is if you really want to, but you’ll probably want to put it on some kind of bread. Toast is the obvious choice but I prefer multi-grain Ezekiel bread or muffins. 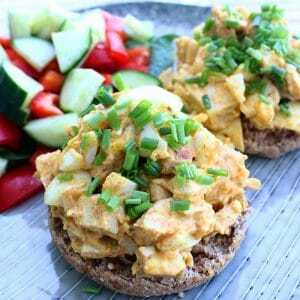 Ezekiel bread is high in protein and has a nice firm consistency that goes really well with the chicken and egg salad. If you really want to go low-carb, you can also use crunchy veggies like cucumber or celery stalks to scoop up the chicken and egg salad. That’s good too, but not as good as putting it on bread in my opinion. You can also check out our roundup of the best diabetic chicken recipes. 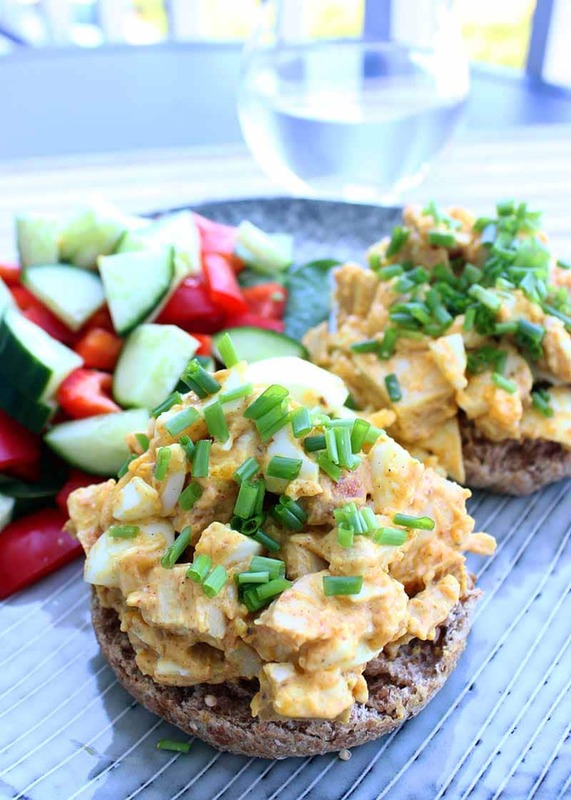 When you’ve tried this healthy chicken and egg salad, please don’t forget to let me know how you liked it and rate the recipe in the comments below! Bake the chicken in the oven at 365 F (185 C) for about 20 min (check with a knife that the chicken is cooked all the way through). Boil the eggs for 8 minutes. Cut chicken and eggs into bite-sized pieces. Mix the mayo with curry powder (I like to use a LOT of curry powder. Start with half a tablespoon and taste before adding more). Combine everything in a large bowl and mix. Let it cool in the fridge for at least 10 minutes (it gets even better if you leave it in the fridge overnight). Serve on toast or muffins with chives and a little salt on top. 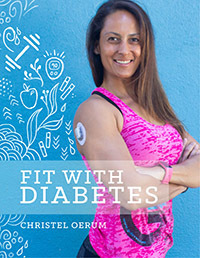 Although Tobias does not live with diabetes, living with Christel for almost 20 years has made him an expert on the subject. 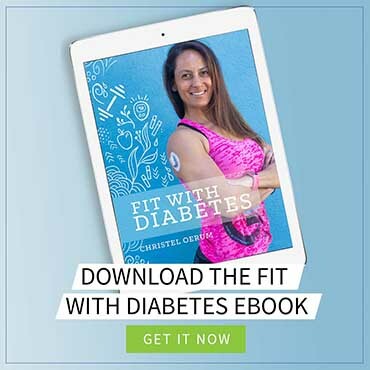 He writes about how to live with and support a spouse who has diabetes. Besides an MBA in International Business & Strategy, Tobias holds numerous coaching, nutrition, and personal training certifications. This was delicious! A perfect lunch. How long is it normally good for? I promise you, it is actually only 1 tablespoon mayo in the photos (it may have had a top on). When you toss everything together, the egg yolk breaks up and combines with the mayo (and they are the same color because of the curry powder). That’s why it looks like there is a lot more mayo than there actually is. But let me re-make it this week to make sure that I am right. I will change it to 2 tablespoons if I feel that is more accurate. This is a great recipe. Super easy and my kids loved it. Thank you. This looks delicious! How many servings does it make? Thank you! Thank you 😀 It makes 4-5 servings, depending on the size of your chicken breast. How much curry powder is “a lot” of curry powder? For me, it’s about a tablespoon, but it depends a lot on the kind of curry powder you are using. With some strong curry powders, a tablespoon will make this completely inedible, which is why I didn’t include a better measurement. I would suggest using a little to begin with and then slowly add more after tasting.